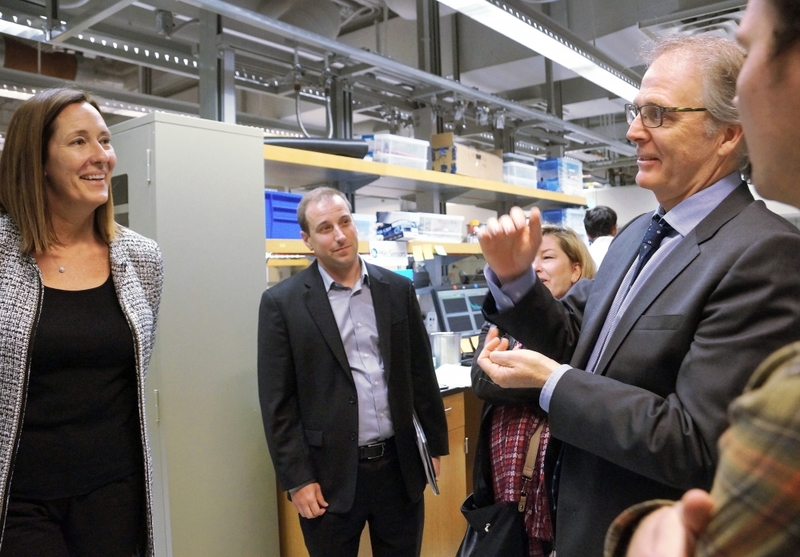 Assemblymember Jacqui Irwin listens as Craig Hawker (right), a professor in UCSB’s materials and chemistry and biochemistry departments, discusses his research. 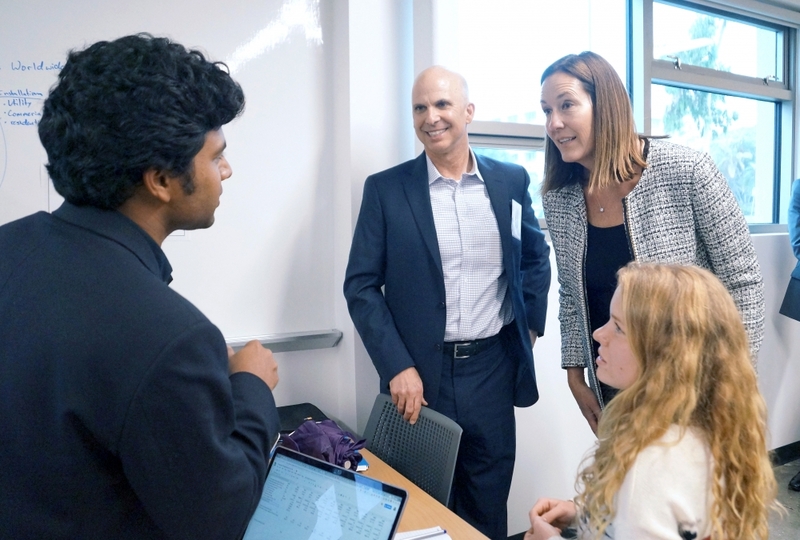 Assemblymember Jacqui Irwin talks with students in UCSB’s Wilcox New Innovation Incubator, funded though AB 2664, a bill that Irwin authored. Joseph Incandela, UCSB vice chancellor for research, outlines some of the scientific breakthroughs that have resulted from collaborative research on the campus. Incandela also holds the Joe and Pat Yzurdiaga Chair in Experimental Science. 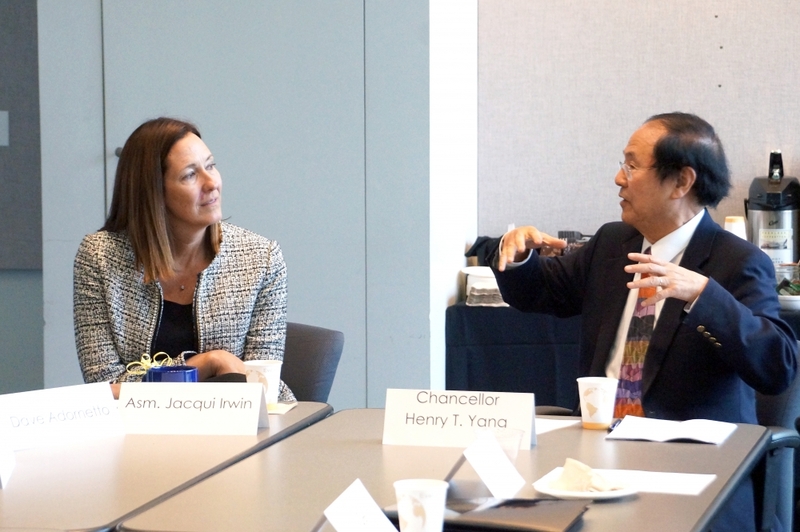 Assemblymember Jacqui Irwin and UCSB Chancellor Henry T. Yang. 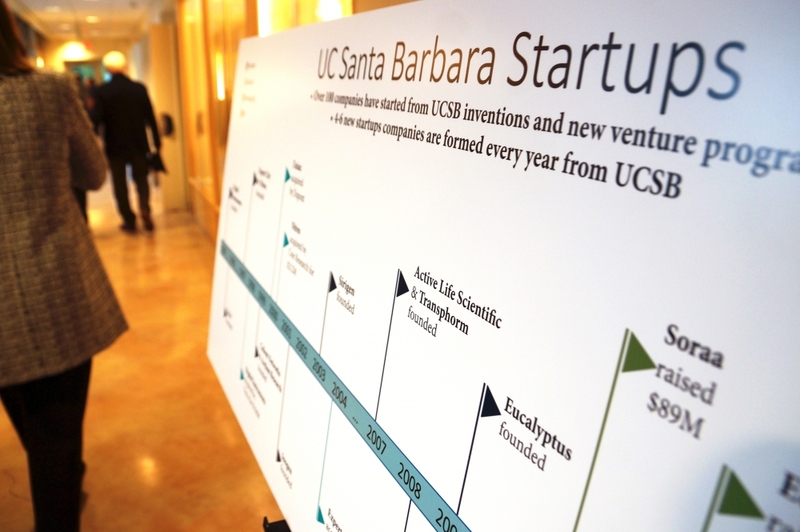 Long recognized as fertile ground for entrepreneurship and innovation, UC Santa Barbara now has a space dedicated to the sharing of ideas and resources to cultivate the next generation of tech startups. Wilcox New Venture Incubator, located on the ground floor of UCSB’s Mosher Alumni House, is the result of a collaboration between the campus’s Technology Management Program (TMP) and Alumni Affairs. It was funded in part by Assembly Bill 2664, University of California: Innovation and Entrepreneurial Expansion. California Assemblymember Jacqui Irwin, D-Thousand Oaks, who authored the bill, joined elected and UCSB officials Friday, March 16, for the grand opening of the new facility, more familiarly known as the Garage. Signed into law in 2016 by Gov. Jerry Brown, AB 2664 provided $22 million in one-time funds to be evenly distributed among the 10 UC campuses for “one-time expenditures for activities to expand or accelerate economic development in the state in ways that are aligned with other efforts to support innovation and entrepreneurship.” Each UC campus has determined how it will allocate its $2.2 million share to align with its research prowess and entrepreneurial strengths. Friday’s celebration capped an afternoon’s visit to UCSB during which Irwin got a firsthand look at AB 2664 funds at work here. At UCSB, the funds have gone, in part, to bolstering the campus’s already formidable suite of tech entrepreneurial efforts and initiatives with infrastructure improvements and funding to enhance the chances of startup success. 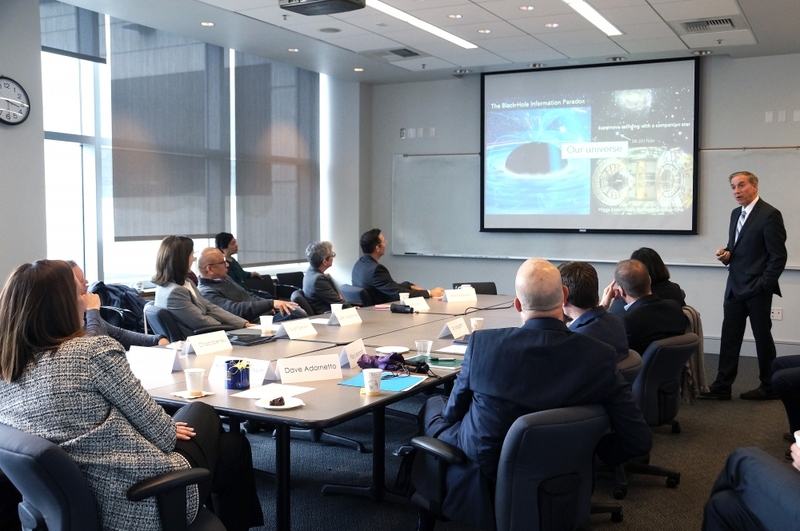 “It is widely recognized that UCSB has a real knack for bringing together great minds from all over the world,” said Vice Chancellor of Research Joe Incandela during a roundtable discussion at the California NanoSystems Institute (CNSI). Incandela outlined the various breakthroughs that have come from research on the UCSB campus. They include advances in diverse research fields, from the comprehensive work in environmental science, policy and business and the ongoing success in stem cell-driven retinal replacement for the treatment of some forms of blindness, to innovations and inventions, such as portable oxygen concentrators, thin-film technology that prolongs the shelf life of produce and prevents food waste, and the development of the world’s most efficient material. Of the roughly 80 startups filed through the campus’s Office of Technology & Industry Alliances over the last 10 years, 80 percent are still in existence or have merged with other companies, Incandela said. The roundtable also included some discussion of veterans affairs — a topic near and dear to Irwin, as her 44th District includes the Port Mugu Naval stations. Susan Derwin, director of the campus’s Interdisciplinary Humanities Center, along with participants in the UCSB Center for Science and Engineering Partnerships and UC Student Veterans Writing Workshop, lauded the campus’s efforts to translate their skills and experience into benefits for themselves and others in their civilian lives. While on campus, Irwin also got a first look at the CNSI’s expanded Tech Incubator and new Innovation Workshop, also known as Makerspace. Both projects, funded by AB 2664, will make it possible for emerging startups to further develop their technology and meet the demands for swift innovation that is a hallmark of tech entrepreneurialism. As the only wet-lab incubator on the Central Coast, the CNSI Tech Incubator’s expanded square footage and new equipment will give convenient access to state-of-the-art facilities required by startups that have a chemical or biochemical component, such as those in the biotech fields. The Makerspace will provide the bench space for rapid prototyping, electronics assembly and testing and 3D printing. AB 2664 also has provided funds to promising startups as they mature from great ideas and inventions to the marketplace. Along with the networking and mentorship that is promoted in places like the Garage, the money provided by the Innovation and Entrepreneurship Expansion initiative helps to provide professional development and training opportunities for startup founders, as well as ease them through what’s commonly referred to as the “Valley of Death” — the point at which raising funds becomes necessary to attract investors and establish the startup in the real world of business. “There’s a lot of training and education that needs to happen to teach people how to build a company and what to do when they have a company to be able to innovate successfully over time,” said Paul Leonardi, TMP professor and a founder of its Master of Technology Management program. Future initiatives may revolve more around attracting and retaining innovators from diverse backgrounds, he said.